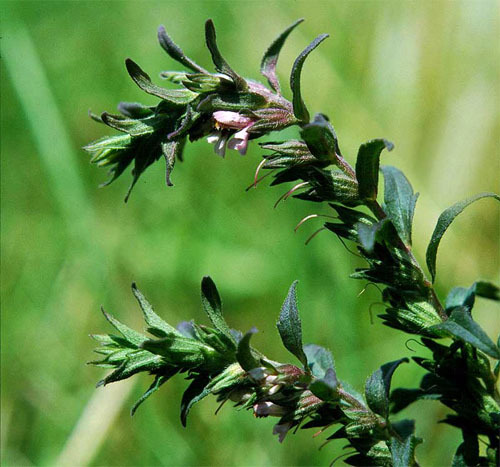 Red bartsia originates from Europe was introduced to Manitoba in the mid-1950s. It arrived at the Gimli Canadian Armed Forces Base in packing crates from Germany and escaped into areas adjacent to the runways which local farmers mowed for hay. Soon, the plant spread throughout the Interlake Region of Manitoba. Red bartsia invades roadsides, pastures and hayland. It is unpalatable to livestock and quickly overtakes forage stands. 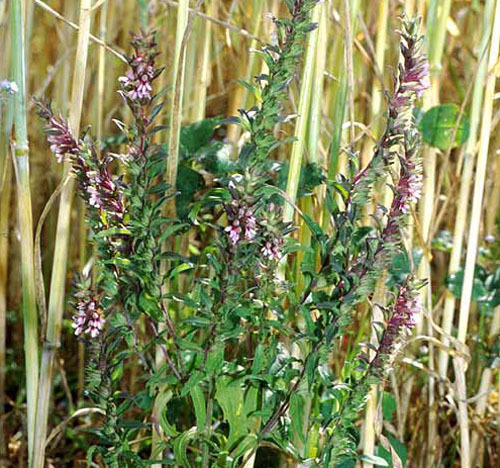 Recent surveys have shown that Red bartsia is now moving into native grasslands. The flowers have united petals with two lips. The upper lip is undivided and the lower lip is divided in three lobes. The flowers are pink, purple or red and about 1 cm long. The oppositely arranged leaves are 2-3 cm long, linear, oblong or lance-shaped, and have toothed edges. Stems are branched, 15-30 cm tall and covered with hairs.